The DEQ ensures that Michigan's air remains clean by regulating sources of air pollutants to minimize adverse impact on human health and the environment. Goals are to meet and maintain air quality standards, limit emissions of hazardous and toxic pollutants, and inform the public about current air conditions. The federal Clean Air Act requires that each state maintain an inventory of air pollution emissions for certain facilities and update this inventory every year. 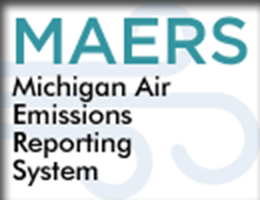 Michigan's emission inventory is collected annually using MAERS. Each year, approximately 2,000 facilities report emissions to MAERS. Emissions data is submitted to the United States Environmental Protection Agency (USEPA) to be added to the national data bank. This information is used to track air pollution trends, determine the effectiveness of current air pollution control programs, serve as a basis for future year projections of air quality, track source compliance, provide information for permit review, and calculate the emissions portion of the air quality fee.